For several years, in response to consumer needs, Shepherd’s expanding product portfolio of high-quality products gluten-free, marked “gluten free”. For customers looking for healthy and natural food also develop a line without preservatives. 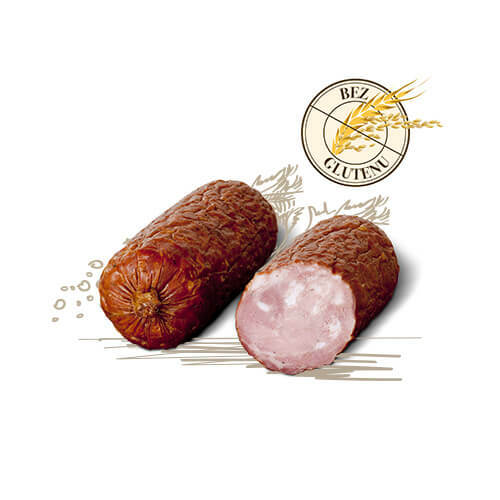 A dried sausage with a wonderful garlic and juniper aroma. Thanks to the precious game meat, this premium quality product tastes delicious. Classical roasted chicken breast made from Polish chicken meat, with a wonderful aroma, goes well with all condiments. This premium quality product is recommended for dinner dishes, salads and sandwiches. Sensational chicken roulade seasoned with a perfectly selected blend of spices. Once you taste it, you will love it. Premium quality product. Turkey meat has undoubtedly many advantages: it is tasty, healthy and low in calories. This product is made with the utmost care about flavour and aroma in order to impress everybody who is passionate about good food. 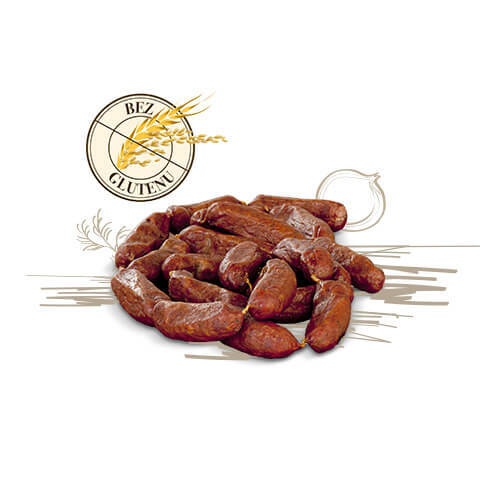 Delicious sausages made from premium quality turkey meat. Through the process of smoking and blanching they gain excellent crispness and juiciness and they simply melt in your mouth. Not surprisingly, after eating one you are tempted to reach for the next. Children’s favourite snack with a tender consistency and delicious taste. Ideal for breakfast and supper, as a cold or hot dish. We recommend them for cocktail stick appetizers with cheese and vegetables or adding them to your favourite salad. Yum-yum! 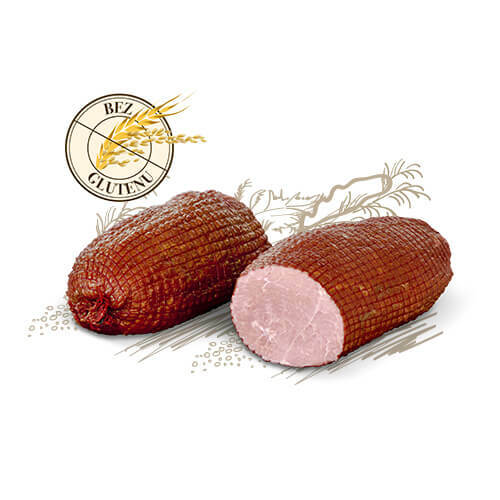 Oryginal ham made from a haunch of pork, long marinated in pickle salt, with allspice and other spices. A premium product awarded with the The best in Poland certificate and Grand Prix Małopolski Smak. 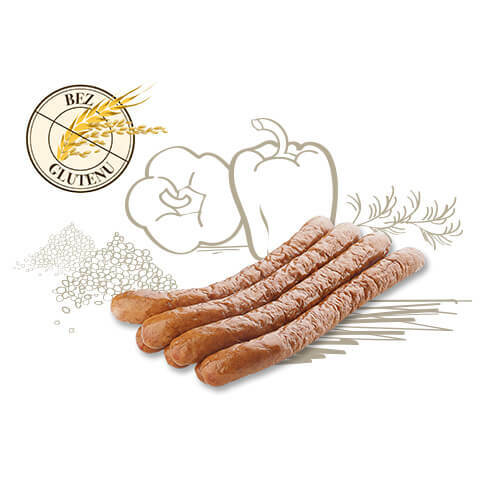 Extremely delicate and fragile veal sausages with the addition of pork. This delicacy is low in fat but high in protein, iron, vitamin B12 which makes it an excellent snack for children and people on a diet – also gluten-free diet. The highest quality product; winner of the prize in the category ‘’traditional product”. 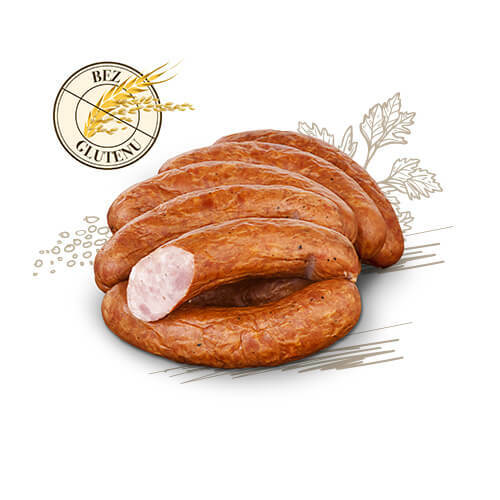 Smoked over the beech and apple wood smoke, seasoned with garlic, onion, marjoram and pepper takes on a multidimentional flavour and aroma – a true gem among sausages. 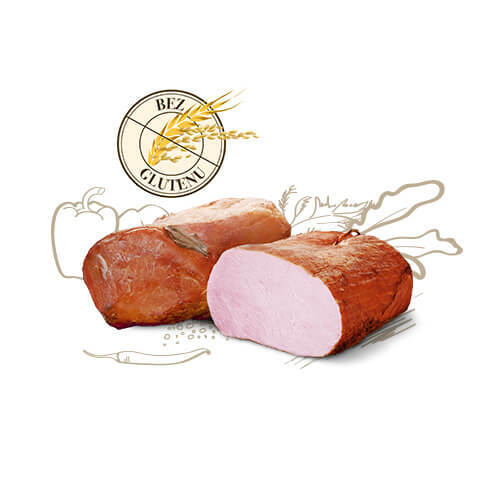 Szołdra is a traditional Polish ham, but we have created something more – an exquisite fragrantly-spiced ham with old character and a thin coating of fat. A real ‘must taste’. 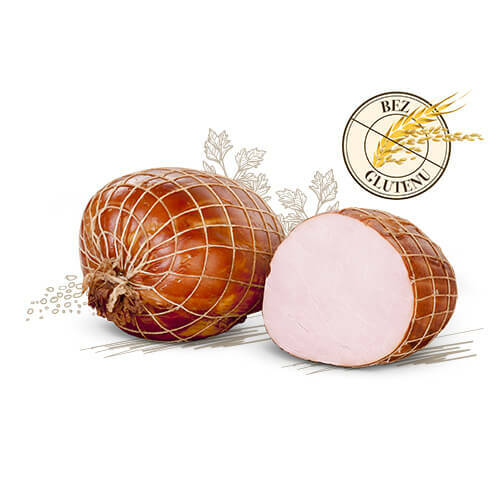 Long matured ham is an excellent ham with the flavour similar to Parma ham. This carefully hand-selected meat is first dried and then cold smoked. Thanks to a special blend of herbs takes on such a great taste and aroma that it would be a pity not to taste it. 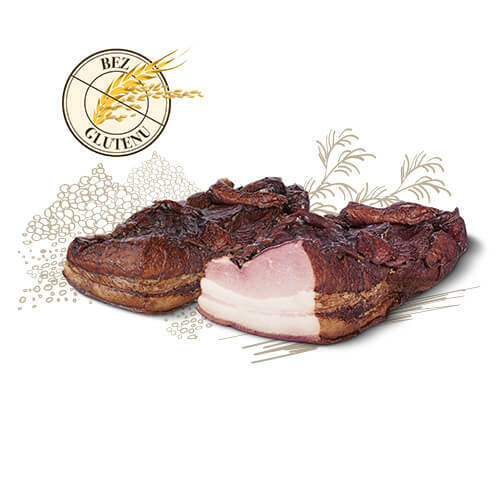 This delicious long matured pork neck, dried and subtly cold smoked, will enrich your diet with easily digestible protein, vitamins from B group, iron and zinc, and equally importantly, add a unique taste and aroma to your menu. This master sirloin is second to none. Carefully selected the most tender pieces of sirloin are blanched and smoked. This premium product stands out for its rich flavour and aroma. Savoury sirloin made from carefully selected pork has an extraordinary colour and a bit malleable consistency. 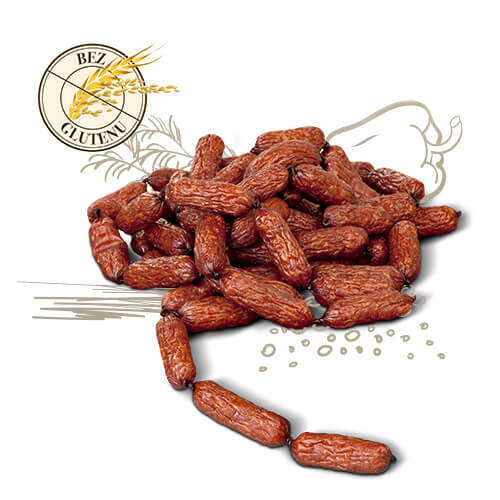 It is slightly salty in flavour and has a gentle smoky aroma. 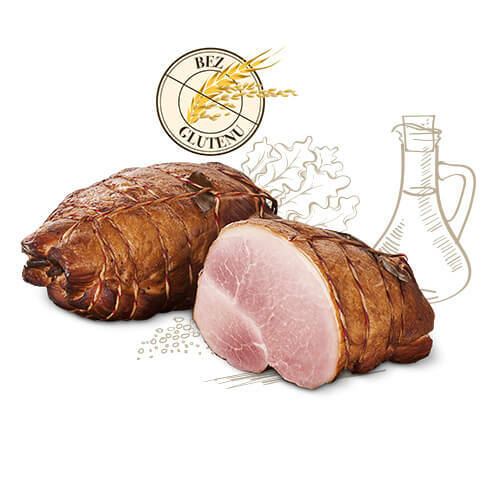 Delicious smoked bacon form Bacówka with golden rind is ideal for roasting, grilling, making stew or split pea soup. Cooked bacon is prepared from the highest quality pork. It has a gentle taste with a hint of smoky flavour. Ideal for those who like juicy and aromatic cold meats. 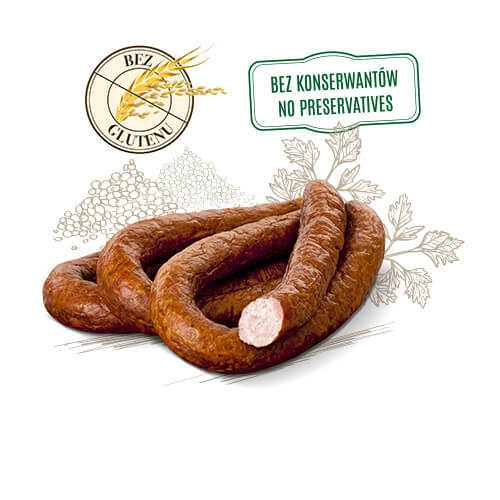 A real rarity on the Polish market; made from excellent quality hand-selected beef. 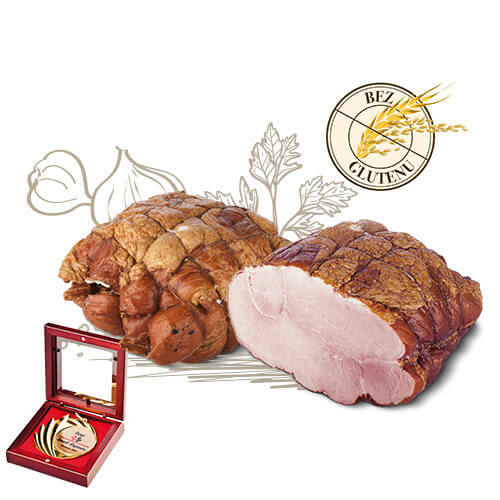 Carefully smoked and cured, acquires its fragility and succulence which are typial features of premium products. 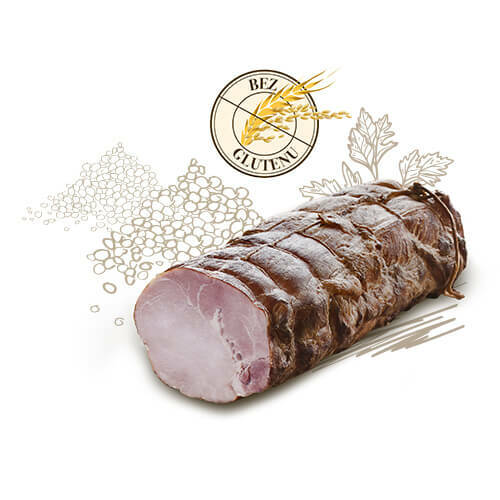 Excellent smoked veal prepared according to the best Polish traditions of curing meats. It delights with the unique aroma thanks to gentle curing and seasoning with fresh herbs. Highly recommended for children and lovers of original meats. 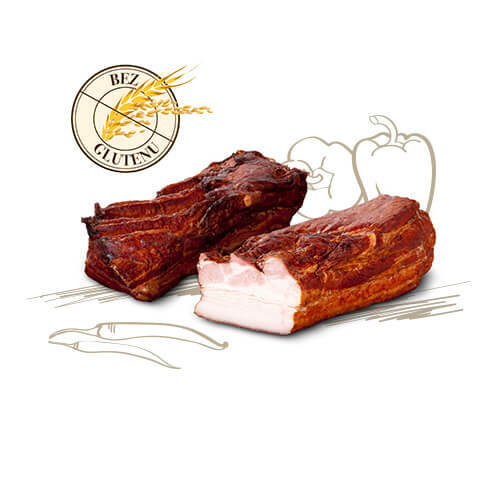 Our native delicacy from Rajbrot – pork smoked over the beech and alder wood. It perfectly matches fresh bread and is ideal for any time of day snack. Premium product. 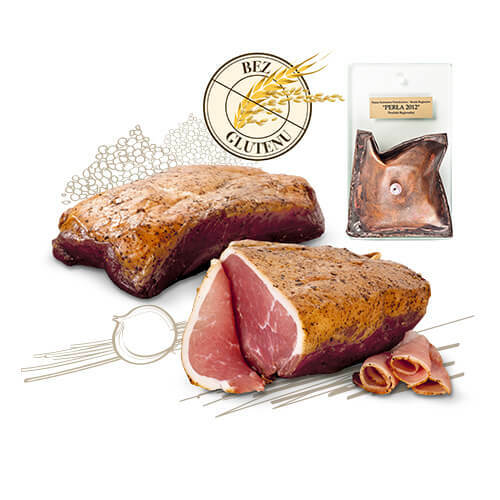 The most delicate piece of sirloin cured in special brine with pickling salt and a fragrant bouquet of spices. It gets the full flavour while smoking over the beech and alder wood. A rarity for connoisseurs of delicious meats. 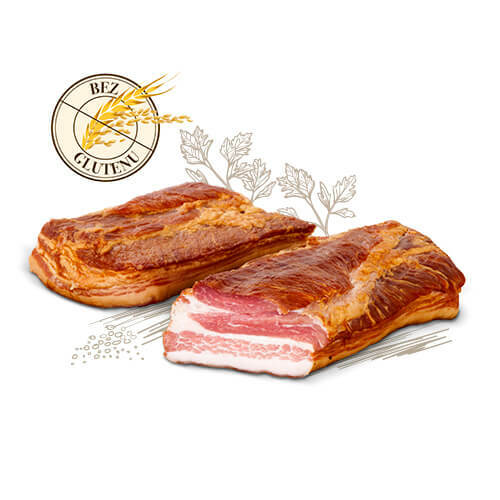 Juicy Shepherd’s bacon is the effect of curing meat in carefully selected aromatic spices and subtle smoking over the beech wood. We highly recommend this premium product to bacon lovers. 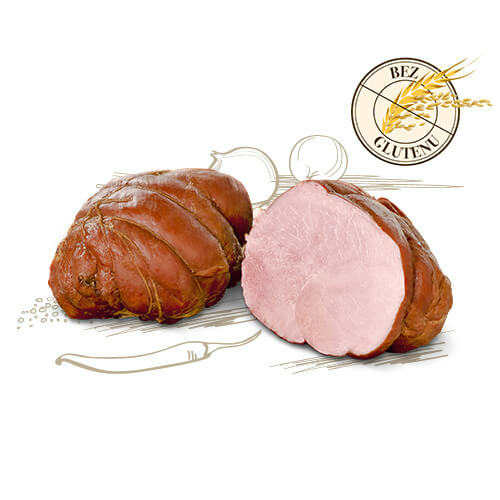 Excellent ham with a rich tasty aroma of slightly smoked meat. 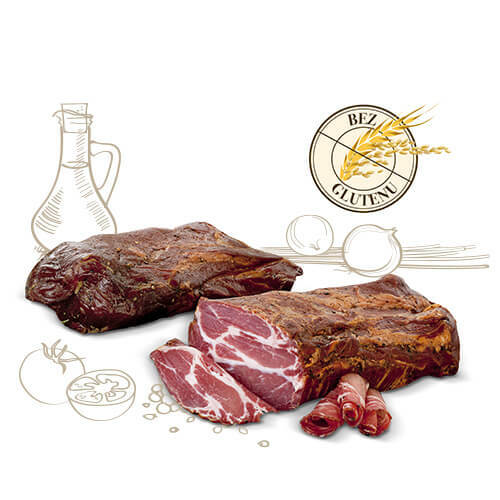 It gently stratifies while cutting which is characteristic for cured meats retaining the structure of muscles. It looks great arranged in slices. Delicate pork enriched with precious and pure Himalayan salt. A slice or two put in a sandwich will make it extremely tasty and healthy. Excellent brawn made with pork knuckle and softy offal has a great aroma and it is properly spiced. Especially recommended as a sandwich topping with the addition of some fresh vegetables. 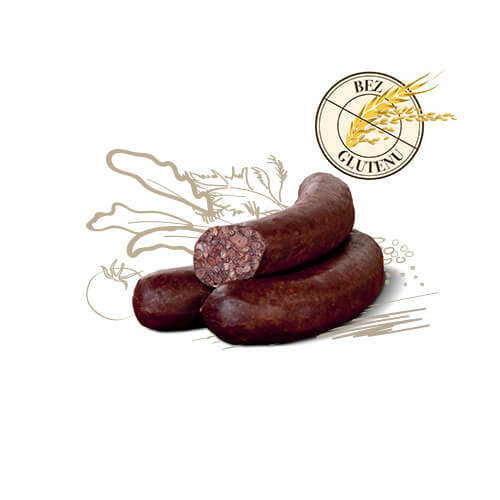 Homely black pudding made on the basis of buckwheat which is considered one of the healthiest foods. It contributes to its dark colour and nutritional values. Perfect for grilling and roasting. 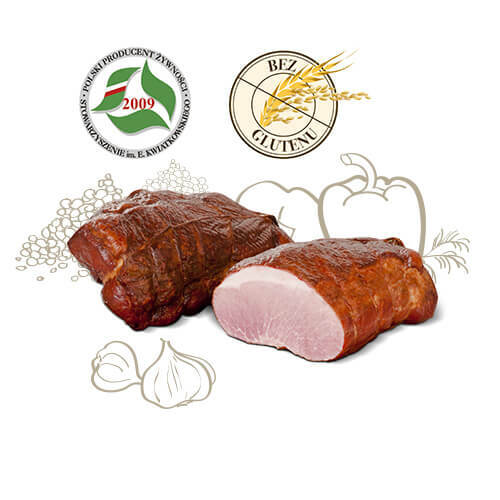 Precious premium quality roast meat, made with the top quality pork. Liberally seasoned with a mixture of cumin, marjoram and garlic, delights with its wonderful flavour and incredibly tempting herbal aroma. 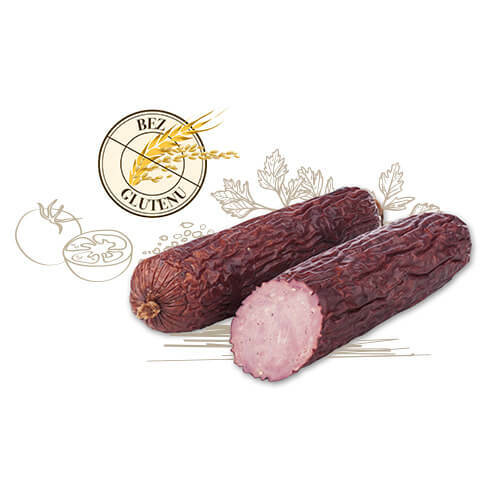 Incredibly tender and aromatic cold meat, with a delicious surprise inside. Popular with children due to its tasty look. Prepared according to a well-tested recipe; without any additives or preservatives. 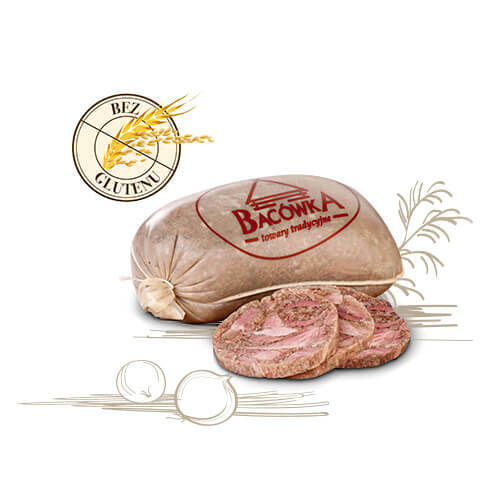 A delicate and fragile premium quality kabanos prepared from deer meat and a little meat from pork shoulder and bacon. After cold smoking it becomes wonderfully tender. An ideally balanced combination of pork and beef with a characteristic juniper aroma. It owns its distinctness and tenderness to the careful process of smoking, scalding and drying. 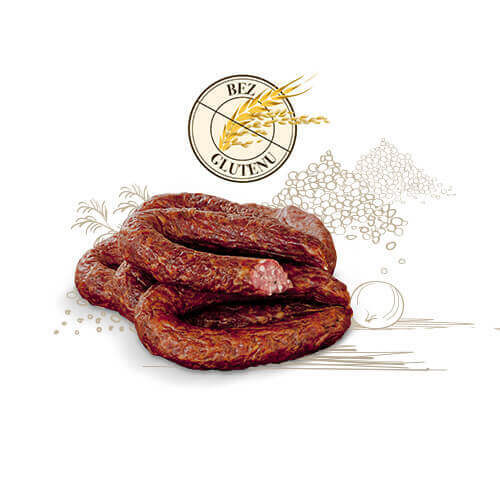 The Polish classic dried sausage delights with the delicious taste with a distinctive spicy aroma. Tastes great solo or in a sandwich. Classic but not ordinary. 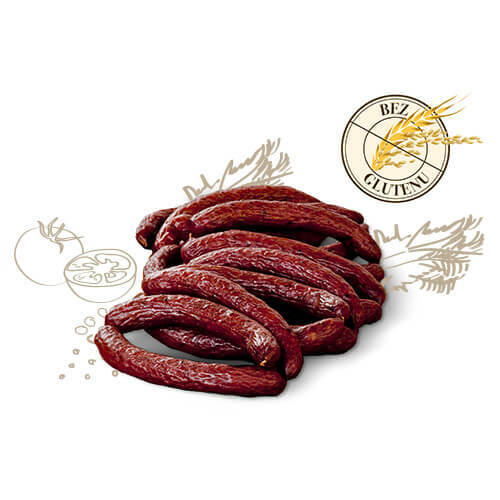 The Krakowska dried sausage delights with its tenderness which is the result of the perfect smoking and drying conditions. It is appreciated for its delicious flavour and aroma. This is a popular and well-known snack. 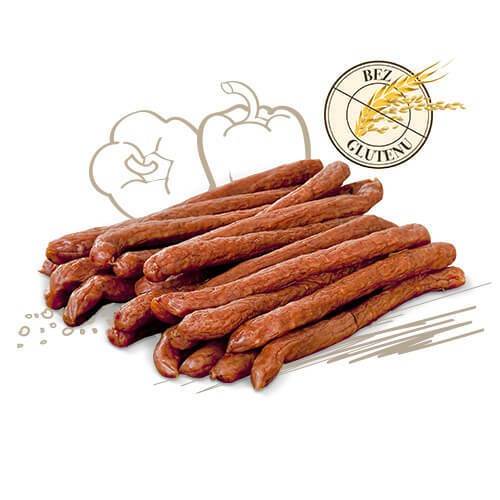 The sausages are prepared from selected, medium ground meat with a hint of spices which give them an ideal spicy flavour. The prime smoked and dried mini kabanoses with a distinct hint of chilli peppers make an ideal snack for any successful party. 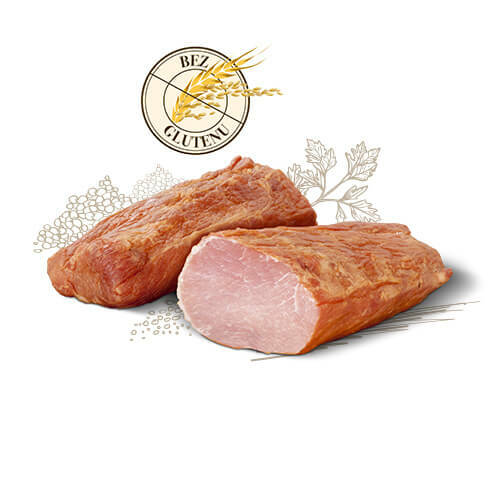 Made from excellent pork with the addition of carefully selected blend of spices. Premium quality product. 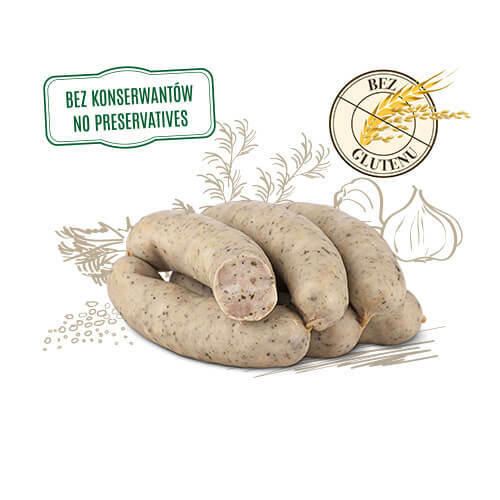 Fans of subtle flavours will love these sausages made from tender rabbit meat. Rich in nutritions, healthy and extremely tasty make an ideal snack for the whole family. 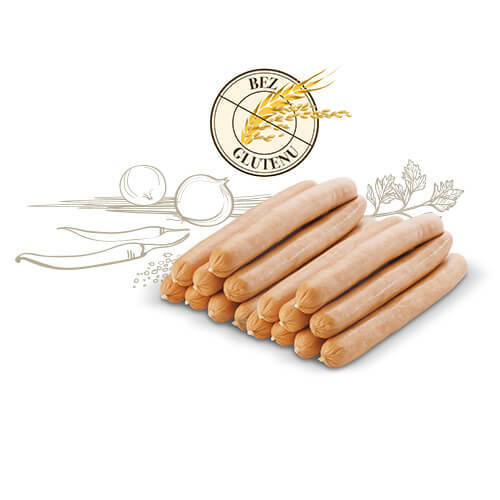 Classic sausage made from high quality pork. Smoked, scalded and spiced with a carefully selected blend of natural seasonings smells and tastes great. 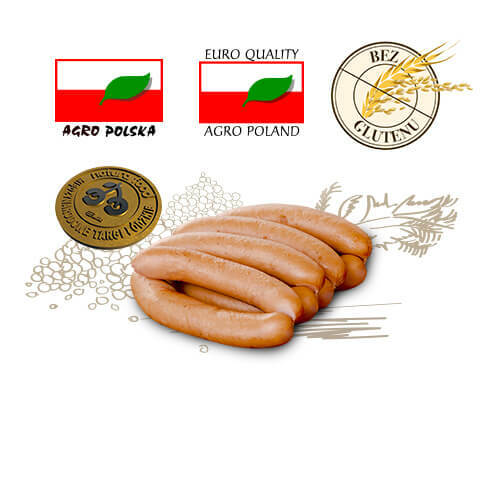 The Pogórzańska sausage is especially recommended for dieting consumers. 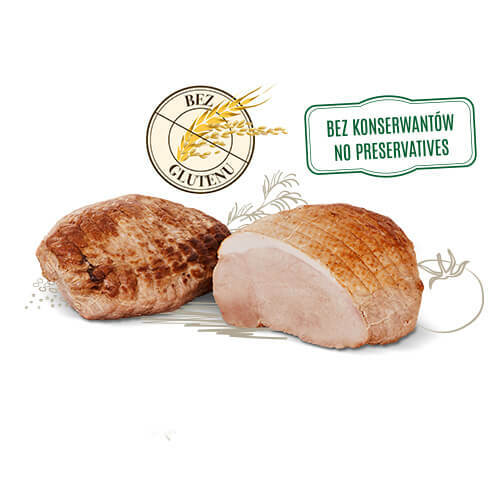 Made from best pork and spiced with an original blend of seasonings is gluten-free and can vary daily meals. 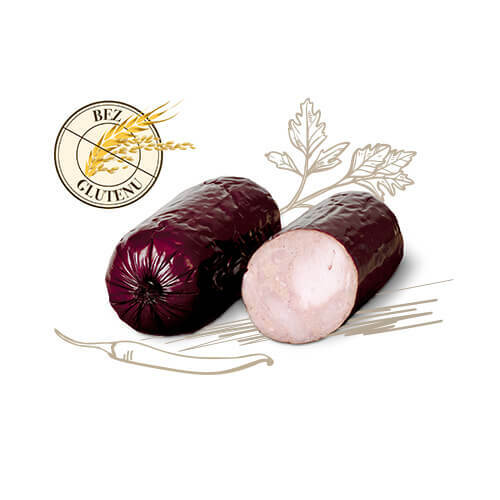 An excellent white sausage from BACÓWKA is perfect both for a main dish or as a soup accompaniment. A sausage with a distinct garlic aroma. Will satisfy amateurs of expressive dishes. Its secret is not only the aroma but also its nice consistency – tender pieces of meat interlarded with delicate fat and jelly. Yum-yum! 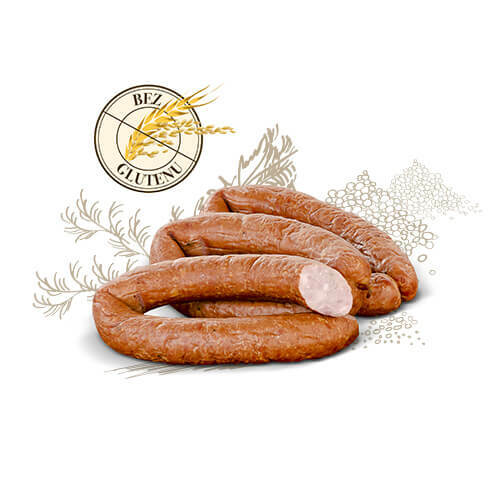 This sausage is a perfect combination of the highest quality game meat with pork. Its tenderness and characteristic shape make it an ideal snack. Premium quality product. Szynka z pieca wyróżnia się wyjątkowo soczystym wnętrzem i wyrazistą, lekko doprawioną skórką. Sprawdzona kompozycja majeranku, kminku i czosnku nadaje jej wyjątkowy aromat. Szlachetny, szary kolor wędliny to zasługa specjalnej receptury, wykluczającej użycie jakichkolwiek sztucznych dodatków. Szlachetna pieczeń klasy Premium, z najwyższej jakości mięsa wieprzowego. Obficie natarty mieszanką kminku, majeranku i czosnku, zachwyca nie tylko smakiem doskonałego mięsa, ale także niezwykle kuszącym, ziołowym aromatem.